Minutes steadily passed one by one until my watch read 06:00 and the sky yielded enough light for Keirra to send us off into La Jolla canyon. I’d made small improvements everyday since I tore my calf seven days earlier, but as of Friday night, I didn’t feel ready to race. Somehow I went to bed believing another six hours of rest would make all the difference in the world, and all the work I had done so far this year would magically come to fruition. For the first few miles up to Mugu Peak, things actually felt fine. I crested the saddle below the peak and started on the gradual downhill. My lips held a guarded smile as the calf was nearly silent -until I hit a slightly steeper and rockier section and felt the twinge on the inside of my calf go off. 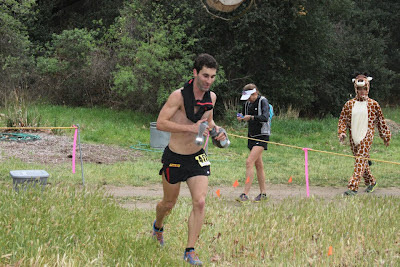 My heart began to sink a bit as I realized I was at mile 3 in a 50 mile race that I should never have started. Hal came up on my shoulder and was also racing with an injury in his Achilles. Neither of us was ready to attack the hard pack clay and sandstone terrain like the lead pack was, but we still were moving quickly through the meadow. 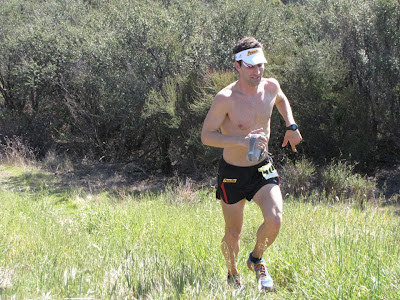 We talked white denim, shoes, visors, and races for several miles. Hal shares a penchant for bad puns and excessive sarcasm, so the otherwise frustrating day was enjoyable for those early miles. Eventually we parted ways at 20 miles or so, and I was on my own for the 2500ft climb up Sandstone Peak. The climb was frustratingly gradual, and I couldn’t get into a groove until the top when it started to get steeper. The descent to Mishe Mokwa had a few steep and technical sections that started to tear at the perforated line across my calf. 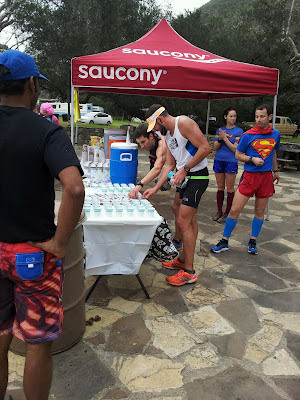 I knew my race was likely about to end soon, but I convinced myself at the last second to push through the aid station and feel the calf out on the next section which was the most gentle and gradual of the race. Everything else felt fine as I zipped through the traverse, until I hit a small downhill on the way into mi 34, and felt the twinge go off like a tazzer in my leg. I called it a day, and went to the finish with Katie and Mari. I could’ve easily finished 2nd or 3rd with Hal in the 50k, but my youthful optimism still believed I could warm up well and gut out 50 miles. In hindsight, if I had finished the 50 miler, I would’ve been really mad if I spent the first good day of running seriously reinjuring myself. All in all, I was just in a tough situation that required a lot more maturity to sit out the race than I had. As I write this, the calf handled a 4 mi run this morning at Crystal Cove, but still kept me a bit guarded. There’s a fine line between breaking apart the knot and just breaking the calf outright. I’m cross training, massaging, icing, and doing everything I can to get the calf back to normal, but normal is pretty demanding. Normal is fluid, dynamic control flying down bear canyon; normal is 20-30,000 ft of climbing (and 20-30,000ft of descent) per week. So, the best I can do is gently add more mileage each day, and keep doing the basics of RICE, massage, cross training, and good nutrition. 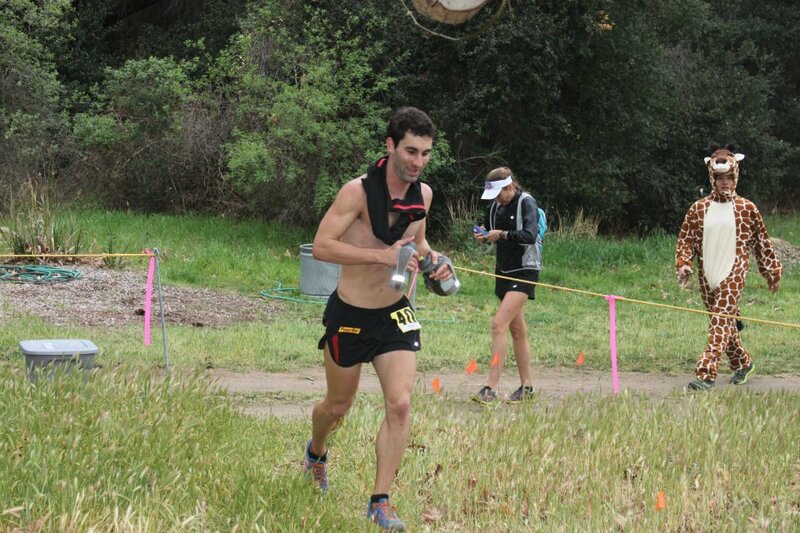 Overall the week was very low, but not terrible with 34 miles in the race. Really solid progressive bluegrass, this is perhaps one of the best albums thus far this year.. Can't wait to get crazy at the show next weekend at the El Rey. Hope you heal soon homeboy! 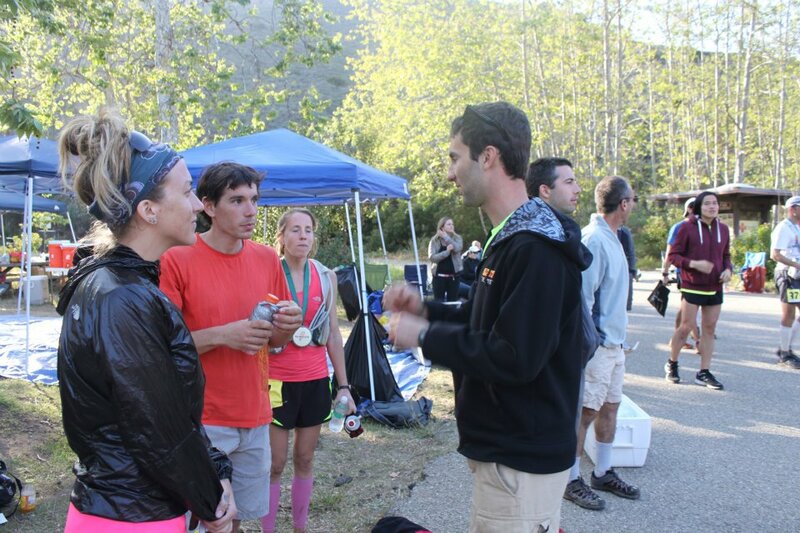 Haven't trained with you in awhile, maybe we can cruise around at Malibu Creek Saturday or hit the front range Sunday? Solid write-up, honest dnf. No shame. Slowly on the up and up, but I gotta make sure the knot isn't going to start ripping things apart again like it did on Saturday. I'd definitely like to hit up baldy on Sunday for sure.